The Carrick-on- Suir of 1958 was an inauspicious location to found a Motor Club.Car ownership was the preserve of farmers and business people and there was no history of motor sport in the area. However it was the brain wave of the late John Lonergan and Mickey Wallace to do so, and the Carrick-on-Suir Motor Club has stood the test of time. That evening, when conversation turned to the founding of, what were known as "lightcar and motorcycle clubs" reflected the needs of motorsport enthusiasts of that time. Like-minded friends and acquaintances’ were canvassed for their supportand the initial meeting was held in the Manor Home of the Butler Family, Carrick Castle. The attendees of the meeting became the first committee and all remained members of the Carrick-on-Suir Light Car and Motorcycle Club for their lifetime. John Lonergan, Mickey Wallace, George Clancy, Mick O’Dwyer, Jim Brett, Alfie Hearne,John Fox , Jim O’Keeffe. Of the above only three survive, George Clancy, Mickey Wallace and Jim O’Keeffe. The first event was a ‘cross roads’ Test Trial (now called Autotests) that were all located in the Co. Waterford.The first one was at Picquetts Cross followed by one at Kelly’s Lodge / Lowry’s Bridge and then onto Clonea (Power). George’s memory is a little hazy, as the route was used in a variety of guises over the years. The Carrick Club became renowned for the length of its Tests and soon attracted drivers from all over the Country. The first hill climb was held in Ballylaneen, Kilmacthomas, Co. Waterford in June 1959and it became an annual event in the Irish motorsport calendar. The Club also used hills in Counties Tipperary and Kilkenny. Alfie Hearne was perhaps our first ‘serious’ competitor. He competed in circuit racing and hillclimbs throughout the 1960’s and in fact raced in all the Dunboyne events. Throughout its early years the dynamic club attracted a large membership, which today is about 220 members, from not alone the adjoining counties but also from across the Irish Sea. The larger membership enabled the Carrick-on-Suir Motor Club to promote the Regularity Trials / Rallies of the time. These were mainly held in daylight and would entail routes in excess of 150 miles, routes of 250 miles were not uncommon. The first stages rally was held in November 1971 and was called ‘The Ravens Rock' It started in Carrick and finished in Mansfields Pub in Mothel, Co Waterford. It was as follows: a midnight start, the route to the stages was via six figure map references. Start the stage at the forestry gate, follow the route arrows, only changes of direction were arrowed, the end of the stage was at the exit forestry gate, timing on sight using ‘pocket watches’ with a sweep second hand illuminated with the bicycle lamp.The arrow signs were fashioned from tin by the late Willie Loughman, to whose name the current forestry rally is dedicated. A later event started at midnight with forestry stages, with the dawn and a few hours to allow the marshals to reposition themselves, it resumed on tarmac and finished in Kilkenny. Within a few short years the event went from a midnight start to a more sociable 10 am start. The Willie Loughman memorial Forestry Rally is Ireland’s longest running forestry rally. Just twice has it been cancelled by circumstances outside the control of the Carrick-on-Suir Motor Club, the out breaks of Footand Mouth disease. 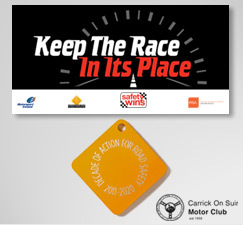 TheCarrick-on-Suir Motor Club was innovative and has been at the leading edge of Irish motorsport events. The late Willie Loughman proposed that there was an opening for a tarmac rally, but one with a difference. At the time tarmac stages rallies were quite rare and challenging to run. His proposal was to change an ‘auto cross’ permit to a permit to allow the Carrick-on-Suir Motor Club run a single stage tarmac rally. 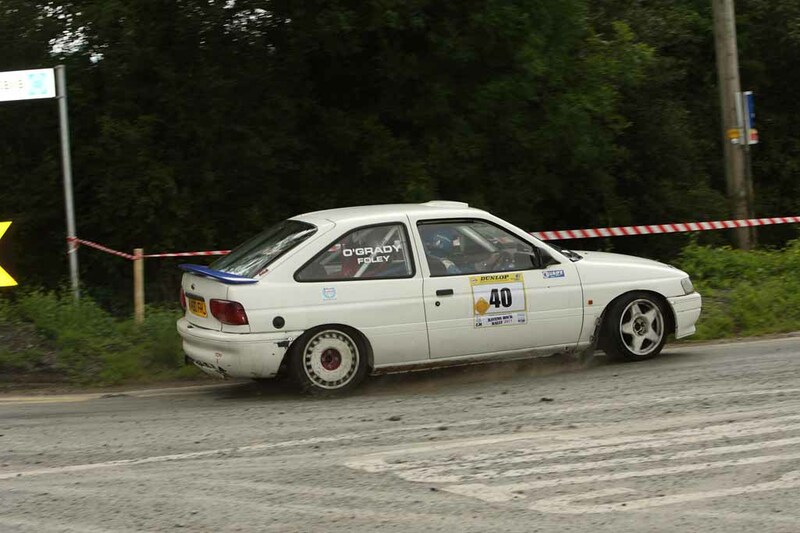 Yes, the first ever, single stage rallywas in Bigwood in Co Kilkenny. The event was an outstanding success and it became the blueprint for similar events run by fledgling clubs to this day. Whilst the Digital Electronic Company were in Clonmel the Carrick-on-Suir Motor Club availed of their technology and had computer compiled results. A Transit sizedvan was required to transport the equipment to the rally HQ in Dooleys Hotel, Waterford. During the past fifty years we, as a club have been fortunate with the quality of our members. Their loyalty and experience has enabled the Carrick-on-Suir Motor Club move from the middle of the twentieth century and to face into the motorsport challenges of the twenty first century. Currently (March 2008) George Clancy is the sole surviving member of the committee of 1958. We look forward to celebrating all the 50th anniversary events with George. It is mainly through his recall that these pages of our history are written. There are others amongst us who have their memories and recollections of events of the past fifty years. This website is available to you to post your recollections and permit us all to share and to smile at the times when it was still motorsport. We will continue to be democratic, innovative but will stay steeped in the tradition of promoting motorsport in it many formats. We are currently investigating replacing our timing equipment (digital clocks) with some very neat state of the art technology timing equipment. A long way from the, 'fob watches' of the early events. The Comeragh Bar and Lounge, Main Street, Carrick-on-Suir was the meeting venue for the first 30 or so years. Stand to the front those you who remember the 'Submarine' or the cellar where deeds of yore were planned. Our current venue is 'The Old Mill' New Street where the owner Tommy Walsh has made us welcome with the use of his meeting room.. Our meetings are on the first Tuesday of the month, exceptions advised to club members as the need arises.